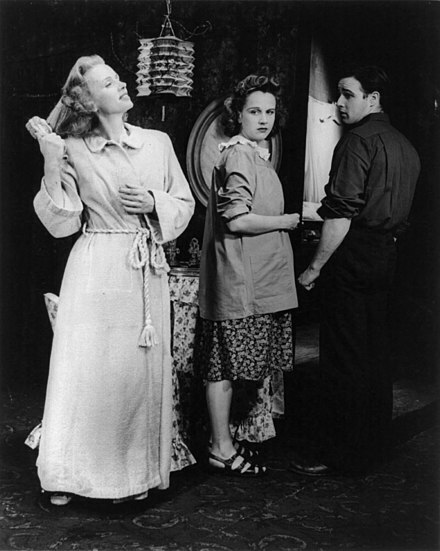 A Streetcar Named Desire is a play written by Tennessee Williams that opened on Broadway on December 3, 1947. The play dramatises the life of Blanche DuBois, a southern belle who, after encountering a series of personal losses, leaves her aristocratic background seeking refuge with her sister and brother-in-law in a dilapidated New Orleans tenement. Thomas Lanier Williams III, known by his pen name Tennessee Williams, was an American playwright. Along with contemporaries Eugene O'Neill and Arthur Miller, he is considered among the three foremost playwrights of 20th-century American drama. After the loss of her family home, Belle Reve, to creditors, Blanche DuBois travels from the small town of Laurel, Mississippi, to the New Orleans French Quarter to live with her younger, married sister, Stella, and brother-in-law, Stanley Kowalski. Blanche is in her thirties and, with no money, has nowhere else to go. The French Quarter, also known as the Vieux Carré or Vieux Carré Historic District, is the oldest section of the City of New Orleans. Founded in 1718 by Jean-Baptiste Le Moyne de Bienville, New Orleans developed around the Vieux Carré, the city's central square. Today, the district is commonly known as the French Quarter, or simply "the Quarter," a reflection of the diminished French influence after the Louisiana Purchase. Blanche tells Stella that she has taken a leave of absence from her English-teaching position because of her nerves (which is later revealed to be a lie). Blanche laments the shabbiness of her sister's two-room flat. She finds Stanley loud and rough, eventually referring to him as "common". Stanley, in return, does not care for Blanche's manners and dislikes her presence. Stanley later questions Blanche about her earlier marriage. Blanche had married when she was very young, but her husband died, leaving her widowed and alone. The memory of her dead husband causes Blanche some obvious distress. Stanley, worried that he has been cheated out of an inheritance, demands to know what happened to Belle Reve, once a large plantation and the DuBois family home. Blanche hands over all the documents pertaining to Belle Reve. While looking at the papers, Stanley notices a bundle of letters that Blanche emotionally proclaims are personal love letters from her dead husband. For a moment, Stanley seems caught off guard over her proclaimed feelings. Afterwards, he informs Blanche that Stella is going to have a baby. This can be seen as the start of Blanche's mental upheaval. The night after Blanche's arrival, during one of Stanley's poker parties, Blanche meets Mitch, one of Stanley's poker player buddies. His courteous manner sets him apart from the other men. Their chat becomes flirtatious and friendly, and Blanche easily charms him; they like each other. Suddenly becoming upset over multiple interruptions, Stanley explodes in a drunken rage and strikes Stella. Blanche and Stella take refuge with the upstairs neighbor, Eunice. When Stanley recovers, he cries out from the courtyard below for Stella to come back by repeatedly calling her name until she comes down and allows herself to be carried off to bed. After Stella returns to Stanley, Blanche and Mitch sit at the bottom of the steps in the courtyard, where Mitch apologizes for Stanley's coarse behavior. Blanche is bewildered that Stella would go back to her abusive husband after such violence. The next morning, Blanche rushes to Stella and describes Stanley as a subhuman animal, though Stella assures Blanche that she and Stanley are fine. Stanley overhears the conversation but keeps silent. When Stanley comes in, Stella hugs and kisses him, letting Blanche know that her low opinion of Stanley does not matter. As the weeks pass, the friction between Blanche and Stanley continues to grow. Blanche has hope in Mitch, and tells Stella that she wants to go away with him and not be anyone's problem. During a meeting between the two, Blanche confesses to Mitch that once she was married to a young man, Allan Grey, whom she later discovered in a sexual encounter with an older man. Grey later committed suicide when Blanche told him she was disgusted with him. The story touches Mitch, who tells Blanche that they need each other. It seems certain that they will get married. Later on, Stanley repeats gossip to Stella that he has gathered on Blanche, telling her that Blanche was fired from her teaching job for involvement with an under-aged student and that she lived at a hotel known for prostitution (the Flamingo). Stella erupts in anger over Stanley's cruelty after he states that he has also told Mitch about the rumors, but the fight is cut short as she goes into labor and is sent to the hospital. As Blanche waits at home alone, Mitch arrives and confronts Blanche with the stories that Stanley has told him. At first she denies everything, but eventually confesses that the stories are true. She pleads for forgiveness, but an angry and humiliated Mitch refuses her the chance at an honorable relationship and attempts to sexually assault her instead. In response, Blanche screams "fire", and he runs away in fright. Hours before Stella has the baby, Stanley and Blanche are left alone in the apartment. Blanche has descended into a fantasy that an old suitor of hers is coming to provide financial support and take her away from New Orleans. Stanley goes along with the act before angrily scorning Blanche's lies and behavior, and advances toward her; in response, she threatens to glass him, but is overpowered. Stanley rapes Blanche, imminently resulting in her psychotic crisis. Glassing is a physical attack using a glass or bottle as a weapon. Glassings can occur at bars or pubs where alcohol is served and such items are readily available. The most common method of glassing involves the attacker smashing an intact glass in the face of the victim. However, the glass may be smashed before the attack, and then gripped by the remaining base of the glass or neck of the bottle with the broken shards protruding outwards. Glassing is easily prevented by using containers made from plastic or tempered glass instead, but they suffer from unpleasant feel (plastic) and higher expense. These alternative containers are slowly being adopted in areas with a high frequency of glassing, such as the United Kingdom and Australia. In New Zealand, a similar phenomenon is referred to as "bottling". Weeks later, at another poker game at the Kowalski apartment, Stella and her neighbor, Eunice, are packing Blanche's belongings. Blanche has suffered a complete mental breakdown and is to be committed to a mental hospital. Although Blanche has told Stella about Stanley's assault, Stella cannot bring herself to believe her sister's story. When a doctor and a matron arrive to take Blanche to the hospital, she initially resists them and collapses on the floor in confusion. Mitch, present at the poker game, breaks down in tears. When the doctor helps Blanche up, she goes willingly with him, saying: "Whoever you are, I have always depended on the kindness of strangers." The play ends with Stanley continuing to comfort Stella, but also fondling her blouse while the poker game continues uninterrupted, as Steve says: "This game is seven-card stud." The original Broadway production was produced by Irene Mayer Selznick. It opened at the Shubert in New Haven shortly before moving to the Ethel Barrymore Theatre on December 3, 1947. Selznick originally wanted to cast Margaret Sullavan and John Garfield, but settled on Jessica Tandy and Marlon Brando, who were virtual unknowns at the time. The opening night cast also included Kim Hunter as Stella and Karl Malden as Mitch. Tandy was cast after Williams saw her performance in a West Coast production of his one-act play Portrait of a Madonna . 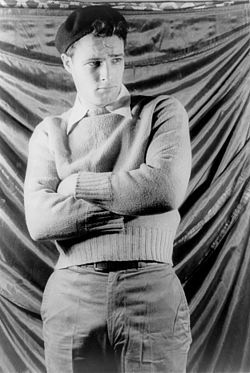 Williams believed that casting Brando, who was young for the part as it was originally conceived, would evolve Kowalski from being a vicious older man to someone whose unintentional cruelty can be attributed to youthful ignorance. Despite its shocking scenes and gritty dialogue, the audience applauded for half an hour after the debut performance ended. Brooks Atkinson, reviewing the opening in The New York Times , described Tandy's "superb performance" as "almost incredibly true," concluding that Williams "has spun a poignant and luminous story." Later in the run, Uta Hagen replaced Tandy, Carmelita Pope replaced Hunter, and Anthony Quinn replaced Brando. Hagen and Quinn took the show on a national tour and then returned to Broadway for additional performances. Early on, when Brando broke his nose, Jack Palance took over his role. 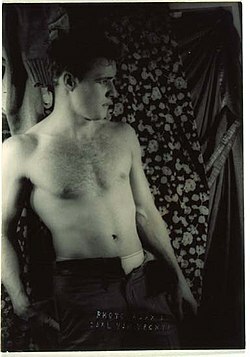 Ralph Meeker also took on the part of Stanley both in the Broadway and touring companies. 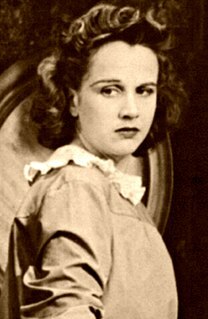 Tandy received a Tony Award for Best Actress in a Play in 1948, sharing the honor with Judith Anderson's portrayal of Medea and with Katharine Cornell. The Shubert Theatre is a 1,600-seat theatre located at 247 College Street in New Haven, Connecticut. Originally opened in 1914 by The Shubert Organization, it was designed by Albert Swazey, a New York architect and built by the H.E. Murdock Construction Company. It is currently operated as a non-profit organization by CAPA under the aegis of the Columbus Association for the Performing Arts. Harold Edgar Clurman was an American theatre director and drama critic, "one of the most influential in the United States". He was most notable as one of the three founders of New York City's Group Theatre (1931–1941). He directed more than 40 plays in his career and, during the 1950s, was nominated for a Tony Award as director for several productions. In addition to his directing career, he was drama critic for The New Republic (1948–52) and The Nation (1953–1980), helping shape American theater by writing about it. Clurman wrote seven books about the theatre, including his memoir The Fervent Years: The Group Theatre and the Thirties (1961). The original Broadway production closed, after 855 performances, in 1949. The first all-black production of Streetcar was likely performed by the Summer Theatre Company at Lincoln University in Jefferson City, Missouri, in August 1953 and directed by one of Williams's former classmates at Iowa, Thomas D. Pawley, as noted in the Streetcar edition of the "Plays in Production" series published by Cambridge University Press. The black and cross-gendered productions of Streetcar since the mid-1950s are too numerous to list here. Tallulah Bankhead, for whom Williams originally had written the role of Blanche, starred in a 1956 New York City Center Company production directed by Herbert Machiz. In a 1992 episode of the The Simpsons , A Streetcar Named Marge , a musical version of the play, "Streetcar! ", was featured. Ned Flanders and Marge took the leading roles as Stanley and Blanche, respectively. The 2005 Broadway revival was directed by Edward Hall and produced by The Roundabout Theater Company. It starred John C. Reilly as Stanley, Amy Ryan as Stella, and Natasha Richardson as Blanche. The production would mark Natasha Richardson's final appearance on Broadway prior to her death in 2009 following a skiing accident. In March 2019 the American Theatre Company of Brussels, Belgium played it on their 50th Anniversary at Le Jacques Franck Theatre  . It was directed by Carrie Ellwanger with assistant director/producer, Robynn Colwell, starring Madeleine Smith as Blanche DuBois, Méabh Maguire as Stella Kowalski, Olu Rufen as Stanley Kowalski, Manu Peix Castiella as Harold "Mitch" Mitchell, C.C. DeNeira as Eunice Hubbel, Aidas Palubinskas as Steve Hubbel. The set was designed by Jeremy Zeegers. As a promotion event, actresses Rebecca Castermans and Cecilia DeNeira were interviewed by BRUZZ Radio  . In 1951, a film adaptation of the play, directed by Elia Kazan, with Malden, Brando, and Hunter reprising their Broadway roles, joined by Vivien Leigh from the London production for the part of Blanche. The movie won four Academy Awards, including three acting awards (Leigh for Best Actress, Malden for Best Supporting Actor and Hunter for Best Supporting Actress), the first time a film won three out of four acting awards (Brando was nominated for Best Actor but lost). Composer Alex North received an Academy Award nomination for this, his first film score. 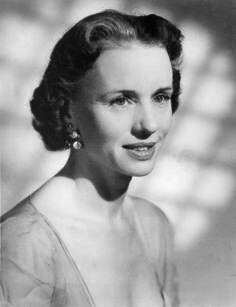 Jessica Tandy was the only lead actor from the original Broadway production not to appear in the 1951 film. The ending itself was also slightly altered. Stella does not remain with Stanley, as she does in the play. Pedro Almodóvar's 1999 Academy Award-winning film, All About My Mother , features a Spanish-language version of the play being performed by some of the supporting characters and the play itself plays an important role in the film. However, some of the film's dialogue is taken from the 1951 film version, not the original stage version. The 1973 Woody Allen film Sleeper includes a late scene in which Miles (Woody) and Luna (Diane Keaton) briefly take on the roles of Stanley (Luna) and Blanche (Miles). In 2006, a production was staged by John Alleyne, then Artistic Director of Ballet BC. The Desire Line ran from 1920 to 1948, at the height of streetcar use in New Orleans. The route ran down Royal, through the Quarter, to Desire Street in the Bywater district, and back up to Canal. Blanche's route in the play—"They told me to take a streetcar named Desire, transfer to one called Cemeteries and ride six blocks and get off at—Elysian Fields! "—is allegorical, taking advantage of New Orleans's colorful street names: the Desire line itself crossed Elysian Fields Avenue on its way to Canal Street. There, one could transfer to the Cemeteries line, which ran along Canal, blocks away from Elysian Fields. "A Streetcar Named Success" is an essay by Tennessee Williams about art and the artist's role in society. It is often included in paper editions of A Streetcar Named Desire. A version of this essay first appeared in The New York Times on November 30, 1947, four days before the opening of A Streetcar Named Desire. Another version of this essay, titled "The Catastrophe of Success", is sometimes used as an introduction to The Glass Menagerie . Esther Davis, better known by the stage name Essie Davis, is an Australian actress. She is best known for her roles as Phryne Fisher in Miss Fisher's Murder Mysteries and Amelia Vanek in The Babadook. Other major work has included a recurring role as actress Lady Crane in season six of the television series Game of Thrones, and the role of Elizabeth Woodville in the television series The White Princess, an adaptation of Philippa Gregory's historical novel. "A Streetcar Named Marge" is the second episode of The Simpsons' fourth season. It first aired on the Fox network in the United States on October 1, 1992. In the episode, Marge wins the role of Blanche DuBois in a community theatre musical version of Tennessee Williams' A Streetcar Named Desire. Homer offers little support for his wife's acting pursuits, and Marge begins to see parallels between him and Stanley Kowalski, the play's boorish lead male character. The episode contains a subplot in which Maggie Simpson attempts to retrieve her pacifier from a strict daycare owner. 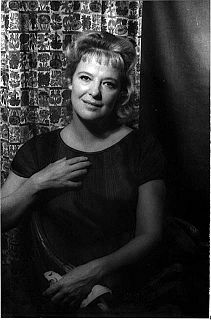 Stella Kowalski is one of the main characters in Tennessee Williams' play A Streetcar Named Desire. She is the younger sister of central character Blanche DuBois and wife of Stanley Kowalski. 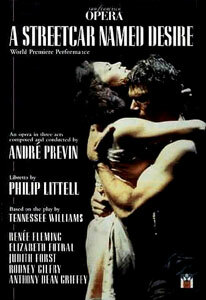 A Streetcar Named Desire is an opera composed by André Previn with a libretto by Philip Littell in 1995. It is based on the play by Tennessee Williams. A Streetcar Named Desire is a 1995 made-for-television drama film directed by Glenn Jordan and starring Alec Baldwin, Jessica Lange, John Goodman and Diane Lane that first aired on CBS Television. Based on the 1947 play by Tennessee Williams, it follows a 1951 adaptation starring Marlon Brando and a 1984 television adaptation. 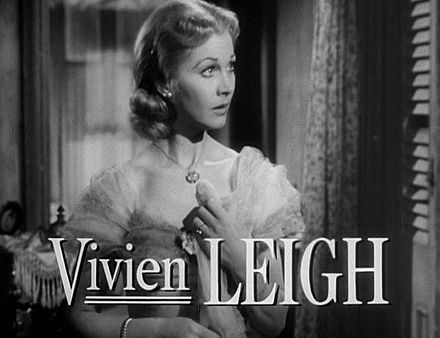 The film was adapted from a 1992 Broadway revival of the play, also starring Baldwin and Lange. Lia Williams is an English actress, known for stage, film, and television appearances. She has also worked as a director. Carmelita Pope was an American actress of stage and screen. ↑ "Production of A Streetcar Named Desire - Theatricalia". theatricalia.com. Retrieved January 28, 2019. ↑ Barnes, Clive (April 27, 1973). "A Rare 'Streetcar'; Fresh Approach Taken at Vivian Beaumont". The New York Times. Retrieved September 26, 2012. ↑ Fenske, Sarah (11 May 2018). "A Streetcar Named Desire Triumphs at the Tennessee Williams Festival". Riverfront Times. ↑ Newmark, Judith (11 May 2018). "'A Streetcar Named Desire' sizzles in its own poetry". St. Louis Post-Dispatch. ↑ "Tennesee Williams' A Streetcar Maed Desire". 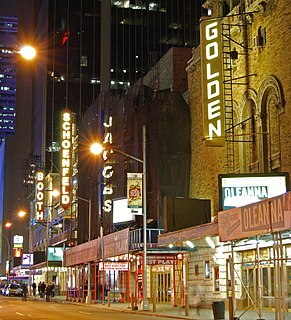 ↑ "The American Theatre Company brengt 'A Streetcar Named Desire'". ↑ Cohan, Steven (1997). Masked Men: Masculinity and the Movies in the Fifties. Bloomington, Indiana: Indiana University Press. p. 254. ISBN 0-253-21127-1 . Retrieved July 11, 2008. ↑ "Movie Review: Woody Allen's Blue Jasmine Is Perhaps His Cruelest-Ever Film". Vanity Fair . Retrieved September 12, 2013. ↑ "Blue Jasmine: Woody Allen's excellent homage to A Streetcar Named Desire". Tri-city Herald . Retrieved September 12, 2013. ↑ Wiegand, Chris (February 5, 2015). "Gillian Anderson goes back to Blanche for prequel to A Streetcar Named Desire". The Guardian . Retrieved October 6, 2016. ↑ "A Streetcar Named Desire - A Streetcar Named Desire". Web.archive.org. October 12, 2013. Retrieved January 28, 2019. ↑ "A Streetcar Named Desire – Ballet in Budapest". Gainsayer.me. May 9, 2018. Retrieved January 28, 2019. ↑ Clark, Nick (July 27, 2014). "Critic claims 'I was the inspiration for Blanche DuBois'". The Independent . Retrieved August 29, 2014.